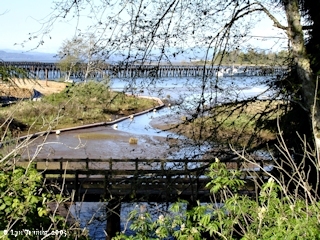 "Mill Creek, Oregon ... (Clatsop County)"
Click image to enlarge Mill Creek merging into Clathlamet Bay, Clatsop County, Oregon. View from moving car. Image taken October 1, 2012. Mill Creek, Clatsop County, Oregon, enters the Columbia River at River Mile (RM) _____, less than 1/2 mile downstream of the John Day River, and 3/4 mile upstream of the tip of Tongue Point. Lewis and Clark camped on the east bank of Mill Creek on March 23, 1806, their first night after leaving Fort Clatsop on their journey home. 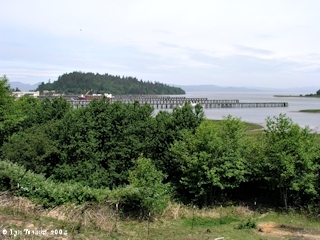 Lewis and Clark's campsite of March 23, 1806, was along the banks of Cathlamet Bay, on the east side of Tongue Point just before reaching the mouth of the John Day River (Clatsop County). Their camp was located on the right bank of a small creek, today called "Mill Creek". "Meriwethers bay" is today's Youngs Bay and "point William" is Tongue Point. 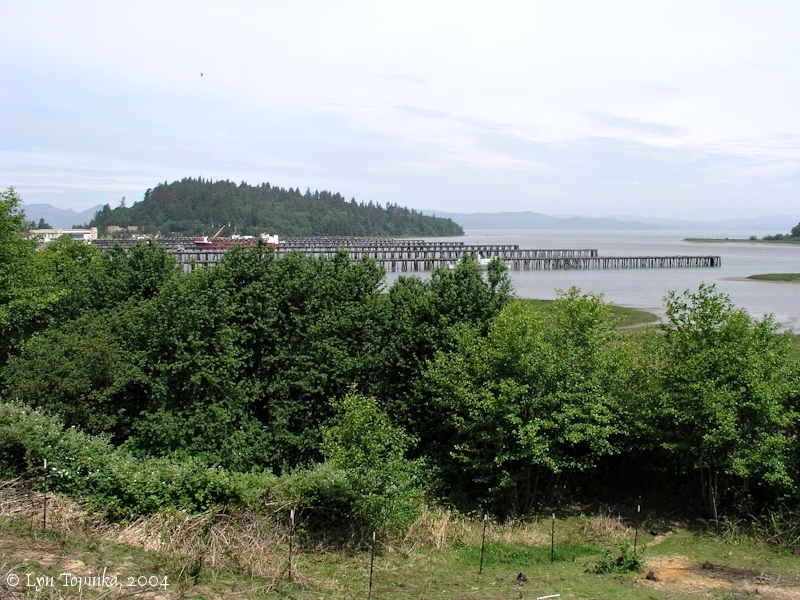 Lewis and Clark's previous campsite was their winter-over camp at Fort Clatsop. Their camp of March 24, 1806 was at Aldrich Point. According to the U.S. Geological Survey's Geographic Names Information System (GNIS) database, there are two other "Mill Creeks" in Clatsop County. One is located just east of Seaside and the other is located in the hills near Svensen and Knappa. 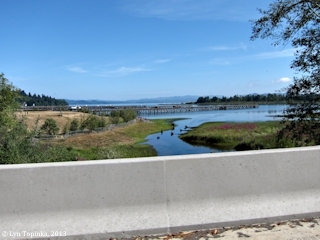 Click image to enlarge Mill Creek, Clatsop County, Oregon, as seen from Oregon Highway 30. Looking downstream. Image taken August 13, 2013. Click image to enlarge East side of Tongue Point. View is looking at the area of Lewis and Clark's campsite of March 23, 1806, lower foreground along the Columbia. 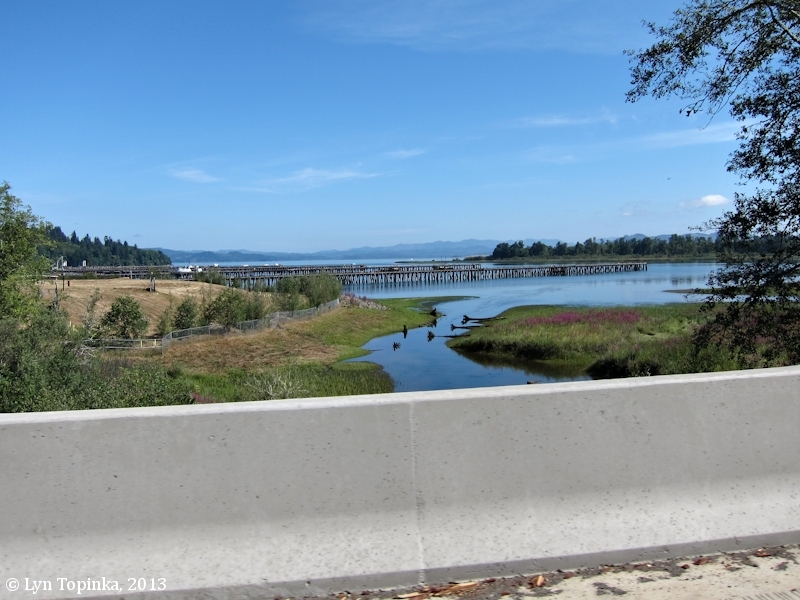 Mill Creek is just visible merging into the Columbia. Image taken May 25, 2004. 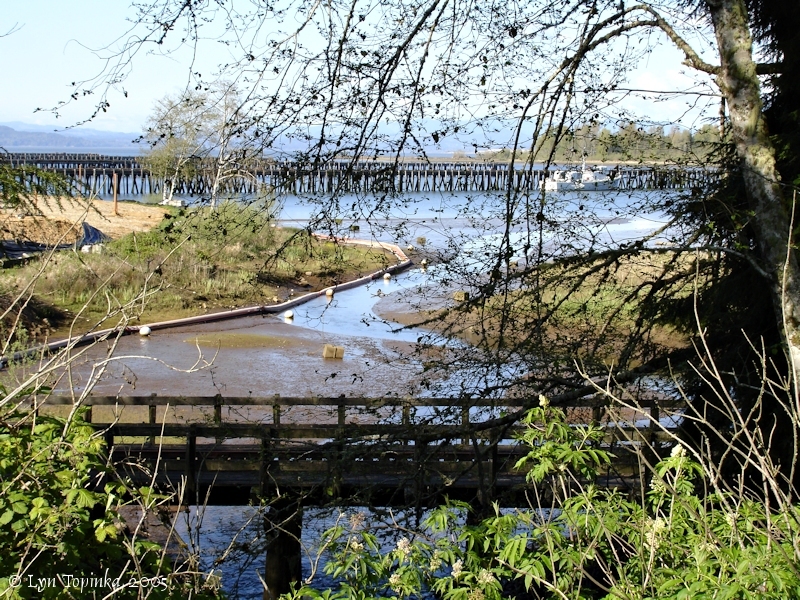 Click image to enlarge Mill Creek area through the trees, east side of Tongue Point. Image taken April 19, 2005. This morning proved So raney and uncertain that we were undeturmined for Some time whether we had best Set out & risque the [river?] which appeared to be riseing or not. ... at 1 P. M. left Fort Clatsop [Fort Clatsop, Oregon, location where the men wintered over] on our homeward bound journey. at this place we had wintered and remained from the 7th of Decr. 1805 to this day and have lived as well as we had any right to expect, and we can Say that we were never one day without 3 meals of Some kind a day either pore Elk meat or roots, not withstanding the repeeted fall of rain which has fallen almost Constantly Since we passed the long narrows on the [blank] of Novr. last indeed w[e] have had only [blank] days fair weather since that time. Soon after we had Set out from Fort Clatsop we were met by De lash el wilt & 8 men of the Chinnooks ... proceeded on, thro' Meriwethers Bay [Youngs Bay], there was a Stiff breese from the S. W. which raised Considerable Swells around Meriwethers point [Smith Point, Astoria, Oregon] which was as much as our Canoes Could ride. above point William [Tongue Point] we came too at the Camp of Drewyer & the 2 Field's. they had killed 2 Elk which was about 1½ miles distant. here we Encampd. for the night [near Mill Creek, just downstream of the John Day River] having made 16 miles. Half after 9 A. M. Colter arrived, having killed one Elk but so distant that we could not send for the meat and get arround Point William [Tongue Point] today, we therefore prefered seting out and depending on Drewyer and the hunters we have sent forward for meat. the wind is pretty high but it seems to be the common opinion that we can pass point William [Tongue Point]. we accordingly distributed the baggage and directed the canoes to be launched and loaded for our departure.- at 1 P.M. we bid a final adieu to Fort Clatsop [Fort Clatsop, Oregon, where the men spent the winter]. we had not proceeded more than a mile before we met Delashelwilt and a party of 20 Chinnooks men and women. ... at a ¼ before three we had passed Meriwethers bay [Youngs Bay] and commenced coasting the difficult shore; at ½ after five we doubled point William [Tongue Point], and at 7 arrived in the mouth of a small creek [Mill Creek, one mile downstream of the John Day River] where we found our hunters. they had killed 2 Elk, at the distance of a mile & ½. it was too late to send after it this evening. we therefore encamped on the Stard side of the Creek. [Mill Creek] the wind was not very hard. There was a cloudy wet morning. ... at 1 o'clock, left fort Clatsop [Fort Clatsop, the winter home of Lewis and Clark]. The afternoon was fair. We proceeded round Point William [Tongue Point], went about 19 miles, and encamped at the mouth of a creek [Mill Creek, one mile downstream of the John Day River], where we found the three hunters that had been sent on a-head, and who had killed two elk about a mile and an half distant. the one hunter stayed out last night rained hard the greater part of last night. this morning proved so rainy and uncertain that our officers were undetermined for Some time whether they had best Set out & risque the [wind?] which appeared to be riseing or not. 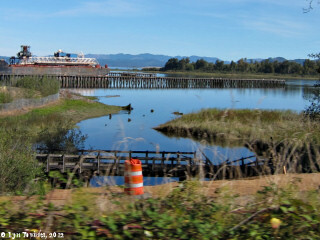 ... at 1 P. M. left Fort Clatsop [Fort Clatsop, Oregon, where the men spent the winter] on our homeward bound journey. at this place we had wintered and remained from the 7th of Decr. 1805 to this day, and have lived as well as we had any right to expect, and we can Say that we were never one day without 3 meals of Some kind a day, either poor Elk meat or roots, notwithstanding the reputed fall of rain which has fallen almost continualy Since we passed the long narrows on the [blank] of Novr last, indeed we have had only [blank] days fair weather Since that time. Soon after we had set out from fort Clatsop we were met by a party of the Chinooks ... proceeded on thro Meriwethers Bay [Youngs Bay]. their was a stiff breeze from the S. W. which raised considerable Swells around Merewethers Point [today the location of Astoria, Oregon], which was as much as our canoes could ride above point william [Tongue Point] we came too at the Camp of G. Drewyer & the 2 Fields they had killed 2 Elk which was about 1½ mile distant. here we Encamped for the night, having made 16 miles. 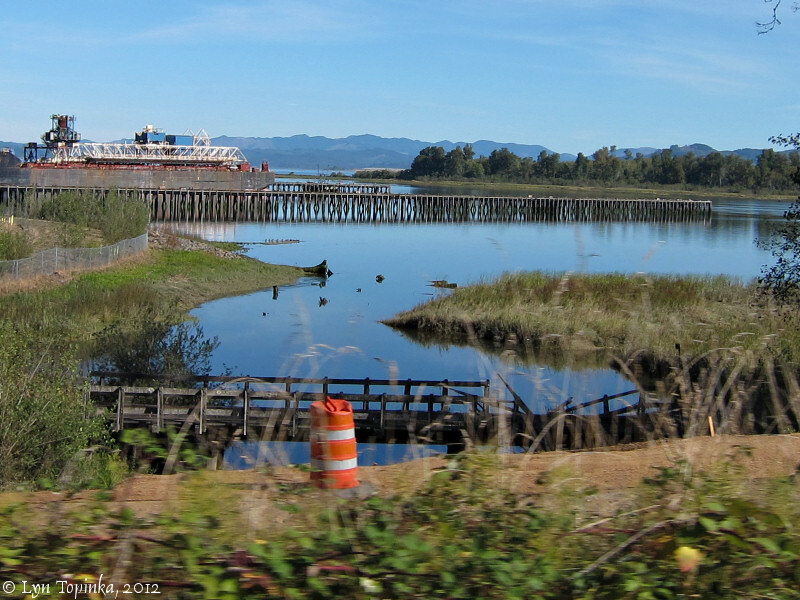 At 1 o'Clock P. M. we embarked, on board our Canoes from Fort Clatsop [Fort Clatsop on the Lewis and Clark River, the winter home of Lewis and Clark], on our homeward bound Voyage. We proceeded on up the South side of the Columbia River, when we were met by a party of the Chinnock tribe of Indians, who belong to the Flatt head nation. ... We then continued on our Voyage, and went round a point of land called by our officers Merryweather point (the Sirname of Captain Lewis) [today the location of Astoria, Oregon] when the wind rose & blew hard from the South West, & the waves ran very high. We proceeded on, & passed another point of land called point William [Tongue Point] by our officers the Sirname of Captain Clark. We halted a short distance above this last point, at a Camp where the two hunters that were sent on ahead of us were. These two hunters had killed 2 Elk, which they informed us lay 1½ Miles from this place. We encamped at that place having come 16 Miles this day.